I beg to momentarily interrupt the proceedings of the Court to discharge a duty eminently pleasant in its performance. We are in the Capitol of a great State. Measured by years, it is without a peer in the galaxy of States of which it is so bright a star. It is fitting that within this State temple, the legislative, judicial, and executive refuse of the members and officers of its various departments, statuary and paintings of men who have become famous in her annals should have a niche and a place. It is fitting that within this retreat, where the blind-eyed Goddess of Justice is ever holding her scales with even poise, there should be some tangible and visible figures to challenge attention, in after years, to those who have become renowned in the administration of her jurisprudence. In obedience to this sentiment, and in conformity with a practice which has already obtained, the Bar of the State has, by voluntary offerings, secured the means to enable me, on its behalf, to present to your Honors the portrait of a distinguished jurist, one of your beloved associates. It must be left to posthumous fame to fully analyze and critically adjust the diverse phases of character and activity which will win for him an imperishable name in the history of Michigan. But it would be a perversion of delicacy to suppose that some of the good things that belong to a man, and which confessedly go to make up, in part, the web and woof of his career, may not be formally and publicly spoken while he yet survives. His judicial career begins January 1st, 1858, with the business of this Court organized in its present form. He is the last of those who originally composed it; and I think it may be said that it has recently been practically determined that he shall wear the honors so generously and happily bestowed during his natural life. In the May succeeding, it was my privilege, together with the talented artist who has delineated the outward features upon canvas, to be called to the Bar as a member of the first class examined, and after an examination before all the Judges. I can never forget how, burdened with apprehension and with doubtful prospects ahead, I was encouraged to hopefulness, when the strikingly imposing figure of the young Judge— youngest by far of the four who composed the Court— descended from the bench, extended his congratulations, and wished me success in the profession I had chosen. To me, so young and so ambitious, it was an unconscious appeal for the development of the best qualities of manhood, and an unconscious tribute to days and nights of earnest toil. The incident was, perhaps, exaggerated to my mind, and invested with a sort of glamour, because he had then already attained a reputation as a wise counselor and a skillful trial lawyer, and I had heard him in the courts, and was impressed with his manner and methods. When he ascended the Bench, he carried with him to that sphere of usefulness the experience of an active practitioner. A study of his judicial opinions of the past thirty years will provoke approval of his learning in every branch of the law. The common law, constitutional law, municipal law as restricted to the rule governing cities and analogous corporations, equitable rights and remedies, — all find in them an exposition which demonstrates how accurately he comprehends the breadth and scope of their principles, and how wisely he applies them in adjudicating the case before him. They evidence the fact that while recognizing the needs of the country in which he lives, and the changes which have made doctrines barren and obsolete, he not infrequently adheres to an established principle or precedent, rather than stray after novelties untried and speculative, though apparently attractive, as temporary expedients. He was so nearly contemporaneous in his early manhood with the creation of the State that he may be said to have witnessed the formation of its first Constitution, and to have grown up with its statutory law. He is profound in knowledge, precise in thought, clear in expression, luminous in diction, skillful in arrangement, an apt student of good English, and a writer of great vigor and versatility, of extended literary acquirements, of scholarly attainments, and of broad and varied culture. No one can look upon the Court of which he is so conspicuous a member, and whose good repute reaches far beyond State limits, and not be persuaded that he has largely contributed to its fame; and yet so modest of demeanor that, to observe him in the midst of an argument, one might imagine that he was a mere listener, waiting in anxious expectation to catch scintillations of wisdom from the humblest source; old and young alike, the novice as well as the gray-haired veteran of the Bar, heard as though all personal distinctions were leveled, as of right they out to be, when a practitioner approaches this tribunal. A listener, when to listen seems irksome, onerous, and useless; patient, when patience seems exhausted; attentive, when the tiresome repetition and opiate monotony of the brethren invite to sleep and calm repose, — these are some of the noted characteristics of the Judge upon the bench. It is also worthy of note in this connection that he was one of the first corps of instructors of the law department of the State University. For a quarter of a century his voice was heard as a teacher and expounder of the law to students from all parts of the civilized world, who treasure and revere his name as a synonym of honor, and price the personal contact as a pleasant and profitable advantage. The excellently executed portrait which I now commit to your keeping is the likeness of a man who has won a loving place in the heart of the profession. His ripened years and honored life command the respect and affection, and his wisdom and learning exact the admiration, of all the lawyers of the State. Among them he stands out in enviable solitude, like the jutting of a great rock into the sea; a bold, fearless, and unique personality, though sweet, gentle, and considerate in his personal bearing; faithful in the discharge of duty, swerved neither to the right nor to the left by considerations foreign to the question in hand, and ever verifying in his action the courage of his convictions. The portrait is so correct, and the person so familiar, that I need not speak his name to your Honors, or to the brethren of the Bar present on this occasion. The present is an occasion on which members of the Bar may express their sentiments without reserve. Judge CAMPBELL is detained at his home by serious illness in his family, and the time is opportune to make the offering now presented by the Bar of the State in commemoration of the important service rendered through so many years by this able jurist. The members of the Court present this morning have listened with pleasure and with pride to the very pleasant and graceful allusions to the pure life, the symmetrical character and judicial eminence attained by our distinguished brother. 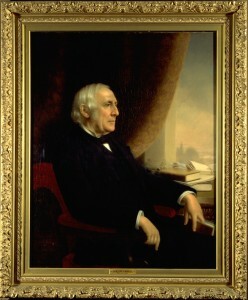 None can better appreciate the learning and ability, the genial manner, the kindly disposition and judicial fairness, and all those qualities of both head and heart so elegantly expressed by his neighbor and friend, Major Griffin, and which have endeared him to the members of the profession, than those of us whose good fortune it has been to be his associates upon the Bench. It is not our privilege, nor is it the proper occasion for us, to pronounce an eulogy upon our honored brother. always felt perfect safety in entrusting to the Court in which he presided the conscience of the State. It is with pleasure the Court accepts from the Bar of the State the admirable portrait of our esteemed brother, and we quite agree with them in the propriety of giving it, at this time, a place upon the walls of this court-room, beside those with whom in times past Judge Campbell was so long associated in building up our system of jurisprudence. The request of Major Griffin will be granted, and the proceedings taken thereon will appear in the next volume of our reports.